* Delivery is available for additional cost. You may also pick up your order. NEW: Hot Toddy Cupcake ~ Classic white cupcake infused with an irish tea blend and spiced with cinnamon and cloves, splashed with Irish Whiskey and topped with a lemon honey frosting, a final dusting of nutmeg brings it all together. NEW: Island Cupcake ~ Pineapple cupcake with a splash of limoncello baked in, topped with a coconut frosting and sweetened coconut flakes to top it off. Pop a paper umbrella in it and you are ready to party. NEW: Strawberry Cheesecake - Strawberry cupcake with cheese cake filling and topped with a strawberry cream frosting. NEW: Caramel Chocolate Cheesecake - Dark chocolate cupcake with cheesecake filling and topped with a fudge frosting & caramel drizzle. Almond Coconut Supreme - Smooth coconut cake with slivered almonds baked inside, with a coconut almond frosting and topped slivered almonds. Chocolate Toffee Crunch - Chocolate Cupcake with Toffee Bits baked inside, topped with a caramel frosting, hardened chocolate and toffee bits. Raspberry Pomegranate Champagne Spritzer - Pomegranate cupcake with fresh raspberry, with a raspberry liquor and champagne frosting and fresh halved raspberry. Caramel Appletini - Sour green apple cupcake with a spritz of vodka, with a caramel cream frosting infused with vodka and topped with a caramel drizzle. Mint Mojito - Tart lime cupcake with a spritz of rum, topped with a cool mint cream frosting with fresh chopped mint leaves. Lemon Drop - Tart lemon cupcake with a spritz of rum, with a limoncello and rum infused vanilla cream frosting topped with crushed lemon drop candies. Pear Upside Down Cupcakes with Champagne Frosting ~ Moist butter cake with fresh pears, real champagne in the frosting. No artificial flavors. Lemon Cupcake with Pomegranate Frosting ~ balancing tart and sweet, lemon cupcake made with fresh lemon juice not zest and a pomegranate infused frosting. White Chocolate Cinnamon Streusel Cupcake ~ Creamy Milk Caramel Ganache and White Chocolate Frosting. Tiramisu Cupcake with Marscapone Cream Frosting ~ A cupcake version of this classic dessert. Chocolate Bourbon Salted Caramel Cupcake with Chocolate Fudge Frosting ~ A combination of salt and sweet. French Toast with Seasonal Berry Cupcake with Pure Maple Syrup Frosting ~ Bringing breakfast to the dessert table. Deep Chocolate Caramel Cupcake ~ Rich chocolate cake, dulce de leche filling and caramel cream frosting. Carrot Cake with Cream Cheese Frosting ~ Special blend carrot cake infused with chocolate roasted almond. Fudge Brownie Cupcakes (with or without nuts) with Fudge Frosting or Caramel Cream Frosting, your choice. Dark Chocolate Pomegranate Cupcakes ~ Dark chocolate cupcakes with a Pomegranite compote, and ganache. 21 cupcakes created this adorable owl on a branch cupcake creation. Using cupcakes as the base, traditional cake decorating techniques, and some chocolate work cupcakes can be made to fit into your event theme. 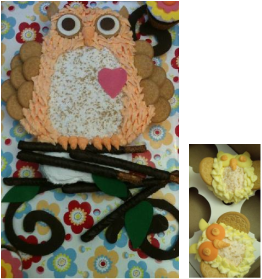 For larger numbers of cupcakes, the overall finished product can be made larger... or as in the case of the owl cupcake creation shown, single cupcakes to coordinate with the theme can make up the difference. The owl cake shown was made for a baby shower, single cupcake "baby" owls fit the theme perfectly. Lemonade or Pink Lemonade Cupcakes for a Cause! Every dollar counts, especially when $1 dollar can supply a year of safe, clean water to someone in Africa. If you love push pop ice cream, you will love push pop cupcakes! 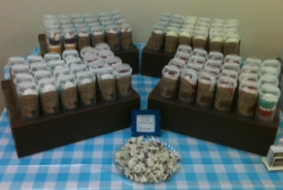 Each push pop container will hold 1-2 mini cupcakes. Choose your favorite single flavor, and stack them 2 high. Or mix flavors! Pair the coffee cupcake and the french toast cupcake and you have a breakfast themed Up-Cake! When choosing a single cupcake, there is space to add decorative elements. Custom printed decorative label FREE. Pricing based on quantity and flavor combinations. Ask for a quote today. A "Smash Cake" is a mini cake used for baby's first birthday photo op. This is the fun cake that baby gets to smash up, mush in their fingers and shovel in their mouths for that ultimate cake faced baby picture. For Baby's First Birthday, I recommend a low sugar or sugar free cake in vanilla or chocolate, or 1/2 and 1/2 with a low sugar butter cream frosting. Perhaps though, you are looking for a fun gift for that friend or family member who is a super cupcake fan. You can have a Smash Cake made in any of our menu flavors. Smash Cakes are $9.99 - $15.99 depending on your cake /frosting options. We can also make a custom cake in flavors not listed. If you order 2 dozen cupcakes or more for your baby's first birthday, I'll give you the Baby's First Cake "Smash Cake" FREE! If you are looking for cupcakes for your child's party or something on the simpler side, your request for traditional chocolate or vanilla cake with buttercream icing is always welcome. Buttercream is available in chocolate, plain white, or tinted vanilla. Sprinkles, dots and confetti are available as well.